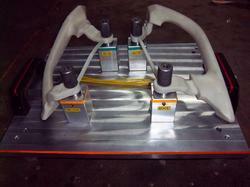 Holding Fixtures are manufactured and supplied by us. These Holding Fixtures are manufactured using optimum-grade raw material that we source from reliable vendors. Our clients can avail from us an eminent range of Holding Fixtures. These Holding Fixtures are manufactured using optimum-grade raw material that we source from reliable vendors. Our products are highly demanded by various small and large-scale industries for regulating the furnace process. We offer complete solution of these products to the clients across various parts of the nation. Moreover, these are provided by us in various specifications to meet the requirements of the patrons. We are leading firm engrossed in manufacturing and supplying an exceptional range of Job Holding Fixtures for Machining. Made from high quality alloy steel and mild steel, these products have created a huge demand for themselves in the respective market. Looking for Holding Fixtures ?